Many visitors to the sunburnt West make the trip across the Nullabor to cruise vineyards, rivers and winding roads. But once a year, a hundred car nuts come to take in the sights at 200km/h. Though the WRC was unceremoniously removed from the calendar a few years back by a Government struggling to financially sustain the event, the latter makes good on some remaining commitment to motorsport with the annual running of Quit Targa West. Now in its fifth year, last weekend's tarmac rally saw a record field of 99 modern and classic cars fly around its fast roads for four rather wet days of competition. Held in and around the Perth shires of Kalamunda, Chittering and Toodyay, the fifth Targa West 2009 was the wettest on record, with torrential rain continuing to turn the red earth emerald green and swamp paddocks and parks with standing water. It was a rally for the AWD, with Evos and STis filling the first 14 spots behind two lightning-quick R35 GT-Rs of local 2008 winner Steve Jones and 2009 Targa Tas victor Tony Quinn. Jones initially gave some time away to Quinn before taking the lead back by day two, and when the weather cleared yesterday his 22sec lead became almost a minute. He claimed back-to-back wins by the close of the rally, taking first by 58 seconds to Quinn, and local ARC hero Dean Herridge took third. Or so we thought. A protest by another team on the VIP Petfood's GT-R's turbos and exhaust saw the CAMS stewards strip second place from Quinn at the last minute. Herridge's STi was awarded second, 90 secs behind Jones, with Alister McRae stepping up to third in a TMR Evo X (+4.05). Despite the awkward late ruling, Jones had nothing but praise for his competition. "Those Queenslander's (Quinn) are just like a dog with a bone, they don't give up. We just had to keep out foot down all weekend and he kept us honest big time, but that's what it's all about you've got to have competition like that," he said. South Australian Kevin Weeks won the Classic Competition class by a massive 3 min 11 secs. Most Thoroughbred Touring type classes are non-competitive,Targa West actually times its Challenge cars and awards placings to third for bog-standard roadgoing vehicles, It's a great way to start rallying, with a speed limit of 130 keeping the danger down (and a GPS tracking system making sure you adhere to the rules) and the ability to enter a car with limited modifications and expenses. 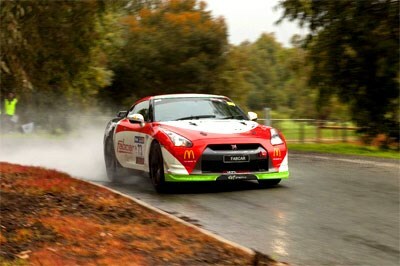 In an appropriate double, our Challenge category was taken out by another Nissan R35 GT-R. But we earned a respectable fifth above Fords and Ferraris, and another Hyundai Diesel managed a commendable third place while matching our fuel consumption of a tank-and-a-half all weekend. Who said motor racing was an elitist sport? A big thanks to the Quit Targa West team of officials and volunteers for a fabulous weekend, and to Melville Holden for preparing a frugal, fun car.